Version 2.0 of CCIZIP. A great Windows 3.X Unzipper. Does ZIP, ARJ, LHA, ZOO, PAK, and more. Totally drag and drop. CCIZip 2.0 is a program that adds a new dimension of file management to your Windows environment. With the magnitude of Windows software getting bigger every day, it becomes annoying to have to shell out to DOS to perform simple file management - like zipping a few files. It is the intent of this program to eliminate all manual shelling to DOS and allow the user to perform all archive file management in a simple, easy to use Windows program. Unfortunately, all computer owners must beware of viruses that could infect their computers, particularly when downloading archive files. The programmers at the Creative Consortium have decided to support the support virus scanning software also. With CCIZip 2.0 you can search the contents of a archive file for viruses without ever leaving the Windows application. The basic functionality of CCIZip 2.0 is not unique. There are several other shareware programs that provide Windows front-ends to archive software and virus scanning utilities programs. However, CCIZip 2.0 offers an unmatched combination of functionality and useability. The CCIZip 2.0 software package assumes that the archive software and virus scan utilities are in your DOS environment path. However, CCIZip 2.0 will, upon intital startup, prompt you for the pathnames of the various support programs you intend to use. If you do not intend to use a particular support program, leave it's entry empty. If you have a particular support program in your DOS environment path, simply specify the program name. If you do not intend to have a particular support program in your DOS Environment path, you must include the pathname in the name of the program. After this, CCIZip 2.0 will store the information in an .INI file so it will always know where to find the support programs. If any of the above information needs to be changed, run the Path Setup option from the File menu to inform CCIZip 2.0 where the support programs are now located. We have augmented the file management functionality -- you can now copy, move, delete, rename, and duplicate files and directories. We have extended the archive protocols supported by CCIZip 2.0 -- you can now ZIP, ARC, PAK, ZOO, ARJ, and UUEncode/UUDecode. (even a batch file) to execute a scan, removing CCIZip 2.0 previous dependency on McAfee Virus Utilities. We have added a Path Setup dialog box which will start up on inital use of CCIZip 2.0 -- you no longer have to make sure your archive software and virsu scanning software are in your DOS path. All of these enhancements have also led us to a new action-oriented drag-and-drop interface for CCIZip 2.0 -- most file management functions can be performed with a simple drag-and-drop. Also, both Browsers now have the same functionality -- CCIZip 2.0 considers archive files to be just another level in the normal file/directory tree hierarchy. You can now manage files within archives just as you would normal files in a directory. We consider the items above to be the advantage CCIZip 2.0 has over other Archive Managers. However, we are still interested in hearing your comments about this program. We consider all comments and suggestions. So please give us call. The CCIZip 2.0 Window contains many recessed icons. These recessed icons are called receptacles, so called because they are the recipients of drags. When an item is dragged into a receptacle, an action takes place. There are 6 different receptacles in CCIZip 2.0; they are the Compress, Uncompress, Delete, Arhive View, Scan, and Convert receptacles. The CCIZip 2.0 Window contains 2 listboxes, Compress and Uncompress receptacles, a status bar, and a drive selector. These are all grouped in a shaded border. These areas are called the Browser, so called because they are how one browses through the file hierarchy in CCIZip 2.0. Registering CCIZip 2.0 does not register the PKZip, LHArc, Zoo, Pak, and Arc programs also!! Why should you register this program? 1. Free technical phone support (313-589-8247). This window displays the name of the current directory in the file browser. If an archive file is open, the name of the open file will be displayed. Drag files to the Compress and Uncompress Receptacles (See Receptacle Usage) to compress or uncompress files in the current file browser. Click on the down-arrow of this window to display a list of all active DOS Drives. Select a drive switch the file browser to the current directory of the selected drive. This window displays the contents of the current directory of the file browser or the contents of an open archive file. Files from the listbox can be dragged to the Receptacles (See Receptacle Usage) or another listbox to perform file or archive management. Double click on an archive file to open it and display its contents. Double clicking a directory will switch to that directory. Double clicking any other file will try to execute that file if it is an executable, or find an associated application otherwise. This window displays the size of all selected files. Directories count as a size of zero. If an archive file is open, the size is the size of the file if it were to be uncompressed. CCIZip 2.0 adds the dimensions of mouse usage that are found in most modern programs. The first of these features is Drag and Drop. Selected files from either of the listboxes can be dragged to another listbox, or any of the available Receptacles. This drag and drop technique can be used as a replacement for using the Pull down menus. The second feature is Popup Menus. By clicking the right mouse button on a file or on the empty spaces of the Browser, you will be presented with a quick list of items that are releated to the specific area you clicked on. All actions using receptacles are initiated by dragging a group of selected files to the receptacle (See Mouse Usage). There is one compress receptacle for each browser. Dragging files to the compress receptacle will add those files to an archive file. If an archive file is open in that receptacle, the files will be added to the archive file using the options specified for the archive program. Otherwise, you will be prompted to enter a new archive file name. There is one uncompress receptacle for each browser. Dragging files to the uncompress receptace will uncompress files to the directory of the browser that contains the receptacle. The destination browser must be in file viewing mode (i.e. an arhive file can not be open). If a list of archive files is dragged to the receptacle, each archive file will be completely uncompressed using the options specified for each archive program. Otherwise, the selected files within an open archive file will be uncompressed. Dragging files to the delete receptacle will cause those files to be deleted. If a directory is dragged, that directory and all of its subdirectories will be deleted. If selected files from an open archive file are dragged, those files will be removed from the archive file. Dragging archive files to the scan receptacle will cause the archive files to be uncompressed in a temporary directory, that directory will then be scanned for viruses using the selected scanning program. The temporary directory will then be removed. Dragging archive files to the view receptacle will view the contents of that archive file. 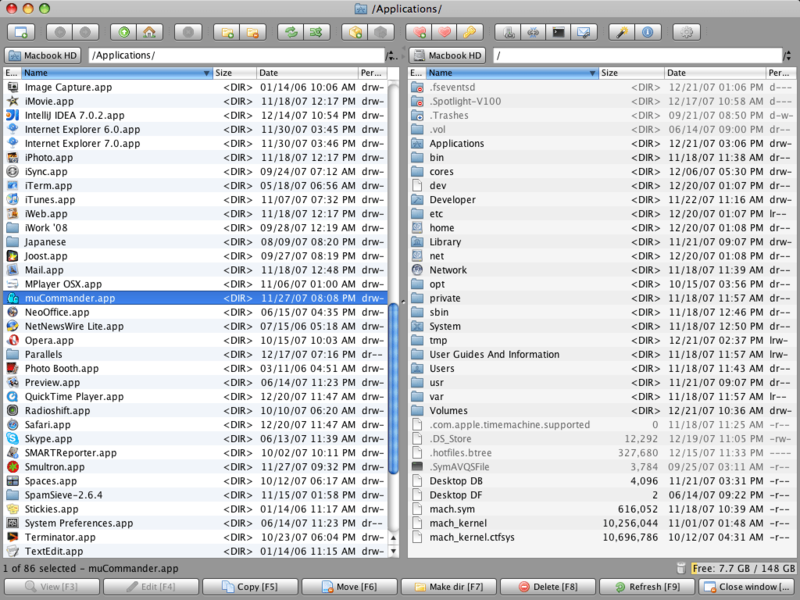 If selected files from an open archive file are dragged, the contents of those files will be displayed. NOTE: View should only be used on ASCII files. Dragging archive files to the convert receptacle will convert those archive files to the format of another archive program. Choose Copy from the File Menu to make a copy of the selected files in the opposite browser. If the selected files are in an open archive file, those files will be uncompressed into the opposite browser. This menu item has the same affect as dragging a group of selected files to the opposite browser. Choose Move from the File Menu to move the selected files to the opposite browser. Choose Rename from the File Menu to change the file name of the currently selected file. Choose Delete from the File Menu to delete the selected files. If the selected files are in an open archive file, those files will removed from that archive file. This menu item has the same affect as dragging a group of selected files to the Delete Receptacle. Choose Duplicate from the File Menu to make a duplicate copy of the selected file. Choose Compress from the File Menu to compress the selected files into an archive file in the opposite browser. If the opposite browser already has an archive file open, the selected files will be added to that archive file. This menu item has the same effect as dragging the selected files to the compress receptacle in the opposite browser. Choose Uncompress from the File Menu to uncompress the selected files of an open archive file into the current directory of the opposite browser. This menu item has the same effect as dragging the selected files to the uncompress receptacle in the opposite browser. Choose Scan from the File Menu to run the virus scanning software against the currently selected archive file. The archive file will be uncompressed in a temporary directory and the contents of that archive file will be scanned. This menu item has the same effect as dragging a group of archive files to the Scan Receptacle. Choose Convert from the File Menu to convert a group of selected archive files to another archive file format. (i.e. Convert a ZIP file to an ARJ file). This menu item has the same effect as dragging a group of archive files to the Convert Receptacle. Choose Archive View from the File Menu to display a detailed description of the contents of an group of selected archive files. If an archive file is already open, then choosing this menu item will display the text contents of the selected files within the Archive File. Choosing this menu item has the same effect as dragging a group of selected files to the Archive Receptacle. Choosing Special from the File Menu displays a sub-menu of functions that can be performed on certain Archive File formats. These special functions are not applicable to all archive file formats. Choosing Comment from the Special sub-menu will allow you to add comments to each of the files contained within the currently selected archive file. Choosing Self Extracting from the Special sub menu will allow you to convert the currently selected archive file into a self extracting archive file. Choosing Fix from the Special sub-menu will allow you to fix the contents of a damaged archive file. Choosing Test from the Special sub menu will allow you to test the data integrity of the currently selected archive file. Choosing UUEncode from the File Menu will Encode the selected files according to the current options for UUE files. Choosing UUDecode options will decode the selected encoded files according to the current options for UUE files. Choose Path Setup from the File Menu to display the Path Setup Dialog Box that will configure the DOS Path locations for the various programs used by CCIZip 2.0. Chose Save Options from the File Menu to save the current options for each of the archive programs to the CCIZip 2.0 Initialization file. These options will be used the next time CCIZip 2.0 is run. Choosing this item will display the Shell Configuration Dialog Box that will configure the speed and compression rate of ARJ compression. Choosing this item will display the Compression Type Dialog Box that will set the filter for all newly added files. Choosing this item will display the ARJ Date Filter Dialog Box that will set the date filter for newly added files. Choosing this item will display the Recursion Dialog Box that will set the attributes that determine how the compression programs will store sub-directories and the files within those sub-directories. Choosing this item will display the Volume Label Dialog Box that will select the drive from which the volume label will be saved into the archive file. Choosing this item will display the Working Directory Dialog Box that will set the directory that the archive program will store its temporary files in. Check this menu item to move(copy and then delete) the selected files into the archive file. Check this menu item to password protect files as they are added to the archive file. CCIZip 2.0 will prompt you for a password before the compression begins. Choosing this item will display the Extract To Dialog Box that will set the output device for the extraction of data. Choosing this item will display the Uncompress Type Dialog Box that will set the filter for file extraction. Check this menu item to create directories as needed in order to duplicate the original directory structure of the archived files. Check this menu item to extract a volume label that is stored within the archive file and overwrite the current volume label. Check this menu item if it is OK to overwrite files that already exist during an extraction. Check this menu item to specify the password needed to uncompress files. CCIZip 2.0 will prompt you for a password before the extraction begins. Choose this menu item to create a new directory in the current browser. The directory will be based off of the current directory in the browser. Choose this menu item to delete all selected directories and any other selected files in the current browser. Choose this menu item to make the current directory in the browser the startup directory for that browser. Every time you startup CCIZip 2.0, this directory will be the current directory of the browser. Choose this menu item to move all of the selected files in the browser to the current directory of the opposite browser. Choose this menu item to redisplay the files in the current directory of the browser. Choose this menu item to select multiple files by wildcard in the current directory of the browser. Standard DOS wildcards are accepted ( * and $ ). Choose this menu item to select all of the files in the current directory of the browser. The file extensions for every archive program are displayed in the Archive Menu. The options for the selected archive program will be displayed in the Options Menu. Check this menu to set the date of the archive file to the date of the latest file contained within it. Check this menu item to store files in the archive file. No compression will be performed. Check this menu item to only extract files that are newer then the files in the DOS directory. Choosing this item will display the Overwrite Dialog Box that will set the attributes that determine when to overwrite existing files within the archive file. Check this menu item to add a comment to the archive file during all compression actions. Check this menu item to add a comment to each file that is added to the archive file. Check this menu item to recursively compress any selected directories. Choosing this item will display the Overwrite Dialog Box that will set the attributes that determine when to overwrite existing files in the destination directory.. Check this menu item to move(copy and then delete) the selected files into the current directory file. Check this menu item to display the archive file comments when viewing the archive file. Choosing this item will display the PKZip Compression Algorithm Dialog Box that will configure the speed and compression rate of PKZip compression. Choosing this item will display the PKZip Date Filter Dialog Box that will set the date filter for newly added files. Select this menu item to display the PKZip View Options Dialog Box in order to configure the sorting pattern when viewing a zip file. Select this menu item to display the UUEncode Encoding Options Dialog Box in order to configure the UUEncode program options. Check this menu item to store, not compress, files in the archive file. Data will simply be stored in the archive file, without compression. Data will be stored with slightly less compression, but it will be performed faster. Data will be stored with even less compression, less memory will be used and the compression will be performed faster. Data will be stored at the fastest possible rate. This compression method results in the lowest compression ratio. Mark this checkbox to set the date of the archive file to the date of the file with the latest date within the archive file. Enter a date in the YYMMDD format. Only files with a time stamp after that date will be added to the archive file. All selected files will be added to the archive file. A selected file will only be added to the archive file if there is already a file of the same name in the archive file and the selected file is newer. A selected file will be added to the archive file if it is not already contained in the archive file or if it is newer then a file of the same name that is already in the archive file. Mark this checkbox to recursively store directories in the archive file. If a directory is chosen to be archived, all of its sub-directories will also be archived. Mark this checkbox to store the path names of recursed files in the archive file. This will enable files to be uncompressed into the same directory structure as they were compressed from. Enter the letter of the drive whose volume label is to be saved into the archive file. Enter the path for the directory which the archive program will store its temporary files in. Select this radio button to extract files to disk. Select this radio button to use printer device LPT1 when the printer radio button is selected. Select this radio button to use printer device LPT2 when the printer radio button is selected. Select this radio button to extract all selected files from the arcvhive file. Select this radio button to extract only those files from an archive file that are more recent then a file of the same name on disk. If the file does not exist on disk, it will be extracted. Select this radio button to extract only those files from an archive file that are more recent then a file of the same name on disk. The file must already exist on disk in order for the more recent file to be extracted from the archive file. This dialog box will present you with a list of all possible archive file formats. Choose the format that you wish each of the selected files to be converted to. Select this radio button to Always overwrite existing files when compressing or uncompressing. Select this radio button to only write over existing files that have an older file stamp than the file that it is to be overwritten by. Select this radio button to prompt the user before overwriting existing files. Select this radio button to never overwrite existing files. Select this radio button to use the Maximal PKZip compression for each file. Select this radio button to only use the PKZip Implode algorithm for all compressed files. Select this radio button to only use the PKZip Shrink algorithm for all compressed files. Select this radio button to leave the date of the archive file unchanged after each compress action. Select this radio button to set the date of the archive file to the current date after each compress action. Select this radio button to set the date of the archive file to the date of the latest file contained within it. Enter a date in the format of MMDDYY to only compress files with a date later than this date filter. Select this check box to display comments stored in the zip file while viewing it. Select this check box to display the contents of the zip file in the reverse order of the selected sorting algorithm. Select this radio button to display the contents of the zip file in the original order that they were compressed in. Select this radio button to display the contents of the zip file sorted by the compression ratios of the compressed files. Select this radio button to use the UUEncode encoding algorithms. Select this radio button to use the XXEncode encoding algorithms. Select this radio button to use the Character Mapping Table encoding algorithms. Select this check box to calculate a checksum for each line in the encoded file. Select this check box to calculate a checksum for each section the an encoded file is broken up into. Enter the maximum number of lines that each section of the encoded file will contain. When encoding, the encoded file will be broken up into files that contain this number of lines. Enter the number of lines of padding to be placed in the first section of the encoded fille. Select this checkbox to run the CCIZip 2.0 shell Minimized in the background. You must run windows in 386 Enhanced mode in order to correctly use this option. It is recommended that you configure the Compression programs to overwrite existing file. If you do not, then the shell will be waiting for user input to determine if it is OK to overwrite existing files. The shell can be maximized at any time by double clicking on its icon. The CCIZip 2.0 shell program will prompt the user to 'Hit Any Key To Continue' after every shell command. Select this checkbox to disengage this prompt. Enter the directory/program names for the following items. If the program is in your path, the program name will suffice. Otherwise, you must enter the full path for the program. If you do not have one of the programs, leave the entry blank. When you hit OK from this dialog box, it will verify the location of each of the programs. Enter the location of the directory containing the CCIZip 2.0 program files. Enter the directory that CCIZip 2.0 will use to store its temporary files. Enter the name of the editor that CCIZip 2.0 will use to edit double clicked files. Enter the name of the PKZip compression program. Enter the name of the PKUnzip uncompression program. Enter the name of the PKZip Fix utility program. Enter the name of the PKZip Zip-2-Exe conversion program. Enter the name of the LHArc program. Enter the name of the ARJ program. Enter the name of the PAK program. Enter the name of the ZOO program. Enter the name of the UUEncode program that is shipped with CCIZip 2.0. Enter the name of the UUDecode program that is shipped with CCIZip 2.0. Enter the name of the Scanning program. CCIZip 2.0 is intended to work with the McAffee Virus Scanning software. However, it can be used with other programs also. When you select an archive file to scan, CCIZip 2.0 will uncompress its contents in a temporary directory. It will then execute ' *.*'. If you wish to use a program that has a different command line, you can write a batch file and insert a %1 where you would like the *. * to appear. You can then specify the batch file name as the Scan Program. CCIZip 2.0 makes use of popup menus to provide object specific functionality. All popup menus are activated clicking the right mouse button on the object. Popups can be activated for either of the two file browsers or for each individual file. Choose this menu item to make the current directory in the browser the startup directory. Every time you run CCIZip 2.0, this directory will the current directory of the browser. Choose this menu item to select multiple files in the current directory of the browser. Standard DOS wildcards are accepted ( * and $ ). Select this menu item to duplicate the currently selected file. Select this menu item to rename the currently selected file. Select this menu item to Encode the currently selected file. The encoded file will have the same name with an extension of UUE or XXE. Select this menu item to Decode the currently selected file. The file must have been previously encoded with a compatable Encoding program. Each archive file program has a unique set of functions. The popup menus for each archive program will contain all of the above mentioned functions plus the unique functions that it can perform. Choose this menu item to add comments to the files contained within the arhive file. Choose this menu item to make a self extracting executable for the currently selected archive file. Choose this menu item to test the integrity of the currently selected archive file. Choose this menu item to change the currently selected archive file into a self extracting executable file. Choose this menu item to fix the currently selected zip file that has errors in it.